My drawings (labelled BT plus date of digitisation) were of specimens mounted on card points. I attempted to blend accuracy (of what I felt were diagnostic details) and artistic impression (to convey something of the general appearance of the specimen). They were drawn as seen under a WILD M5 stereomicroscope fitted with a camera lucida type drawing tube, and using incident illumination from a WILD low voltage source. The original drawings were made in black Indian ink on art paper. 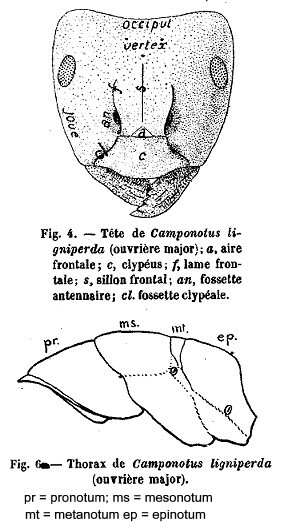 The magnification chosen for any one species was generally such that the whole ant could be seen filling a single field of vision, and an (approximate) scale is indicated on each drawing. My drawings are all labelled with BT . To ensure access to older figures, I have included numeorus drawings culled from historic publications, all are clearly labelled as to source. and Pronotal Width, PW, maximum width in dorsal view. Scape Index, SI = (SL X 100)/HW ; Cephalic Index, CI = (HW X 100)/HL ; Ocular Index, OI = (EL X 100)/HW [EL is eye length]. The differentiation of species using dichotomous keys uses a number of body parts as the defining elements. Most of the body parts are shown in the labelled drawings, others are listed below. The glossary draws on Bolton (1973a) and Bolton & Collingwood (1975). 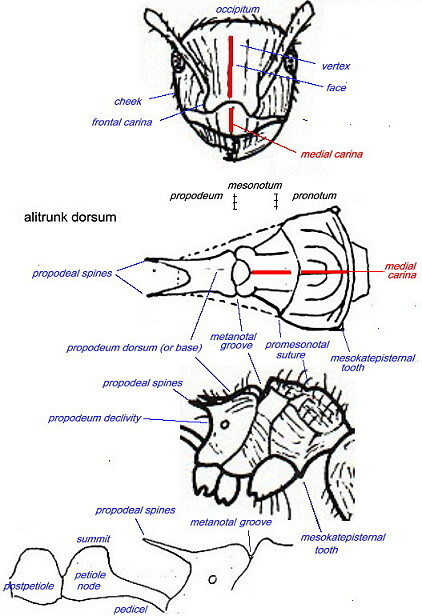 Some recent authors use the term "mesosoma" for the alitrunk. 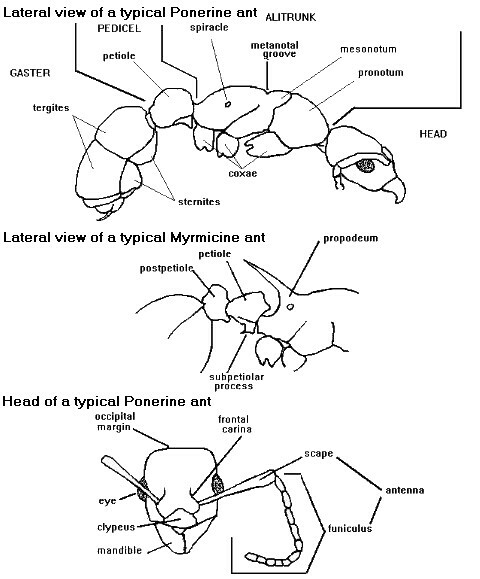 I (BT) feel that is misleading because translated mesosoma = middle body and you cannot have a middle to an organism with at least four visually separable parts (five on ants with the pedicel divided into petiole and post-petiole). Technically also the propodeum and pedicel are part of the archaic posterior of the insect body. The word hair is used throughout rather than the more traditional seta (plural setae). I (BT) feel the latter should be reserved for the stout structures on the legs of many ants. Acidopore - a circular or subcircular orifice formed by the apex of the hypopygium (last visible gastral segment) in the subfamily Formicinae. Antennal scrobe - a longitudinal depression in the side of the head, either above or below the eye, which can accommodate the scape or the whole of the antenna. Carina (te) - ridge (ridged or furnished with a raised line or keel). Clavate clubbed or enlarged at the tip. Costulate - in narrow ridges. Crenulate - finely notched or scalloped. Denticulate - with minute tooth-like projections. Emarginate - notched, with a piece of any shape cut from the margin. Falcate - bent or curved like a sickle. Flagellate - whip-like, often wavy. Fovea - small depression or pit. Geniculate - abruptly bent, elbowed. Gula (r surface) - the median underpart of the head. Pectinate - with branches like a comb. Pilosity - hairiness (especially covered with soft, flexible hair). Punctate - with fine punctures or pits. Pygidium - the last visible gastral tergite. Reticulate - meshed, like network. Rugose - marked by rugae or wrinkles. Spatulate - with broadly elongated apex. Squamiform - having the shape of a scale. Striate - in fine ridges or lines. Suborbicular - hairs with rounded apices. Trifid - split in three by deep clefts as notches. 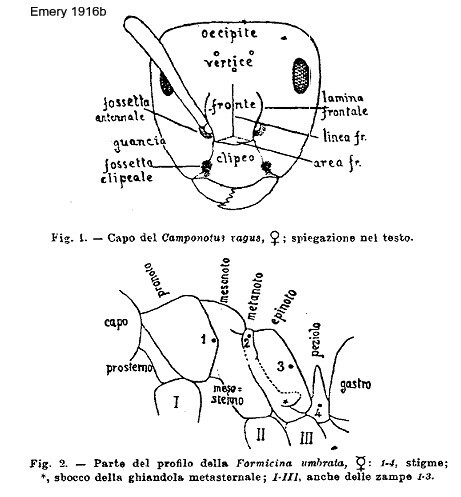 Italian to English - Emery (1916b: 88-90) defined taxonomic terms in Italian; his images for workers are right. trapue = thick-set (stocky) in build or appearance. Allometric growth - differential growth, usually with regular ratios of body parts in different morphs (as in Dorylus). Claustral - colony founding by a fertilised female living in seclusion and feeding the first members of her colony. Commensal - species which feed upon the food supplies of another species but without harming the host species. Dichthadiigyne - a special type of female in some types of ant which are wingless, without ocelli and capable of periodic enlargement of the gaster and a high reproductive output. Epigaeic - a species living on the surface of the earth or arboreally. Ergatoid or Ergatogyne - a worker-like female, wingless and usually capable of laying eggs. Hypogaeic - adapted to an underground mode of existence, with or without surface activity. Legionary - predation combined with nomadism, found in some ponerines and dorylines. Monogyny - having only one queen per colony. Trophallaxis - exchange of food or other substances between members of a colony of social insects. Trophosphere - area in which food is available to a colony.